Blue summit is a bluegrass/swing band of originals and some classic songs. Blue summit is based in Santa Cruz that originated at Strawberry Music festival in 2015. It is composed of friends that have been playing music together at festivals all over California for years. Lead vocalist Aj Lee has recorded with many professional bands including the Tuttle Family band and has also made her own cd made of mostly originals. She has won female vocalist of the year by northern California bluegrass association six times. Guitarist, Sully Tuttle has also recorded and toured in his family band The Tuttle Family Band which has picked up great recognition on YouTube with over a million views on many performances, he also won best male guitarist of the year by the northern California bluegrass association. Other guitarist, Jesse Fischman, has played with the many bluegrass and country growing up in Sonoma County and is well known in the bluegrass community. He currently studies Biology at UCSC. Fiddle player Sam Kemiji, is a classically trained violinist who ran into bluegrass and has been playing with many groups since. Bass player, Isaac Cornelius has been in the bluegrass community since a child and has been picked up by many bands on the way. 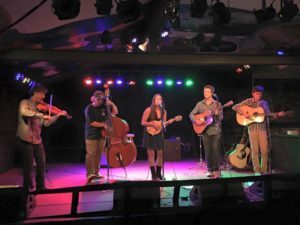 Blue Summit is an up and coming band that is playing many festivals this summer and around Santa Cruz in the coming months!